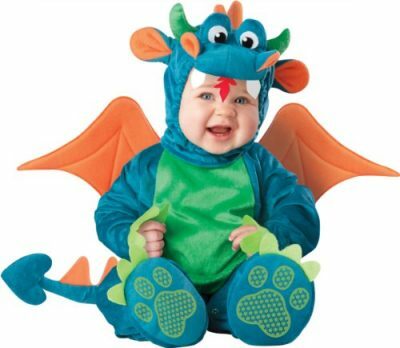 Our baby dragon costume reigns supreme, from its soft, “spiny” tail to its magical wings! Outstanding quality, with many enchanting details. 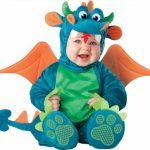 Kids’ dragon costume includes plush, fully-lined jumpsuit, great stuffed, character headpiece, non-slip booties, and easy, snap-on wings. 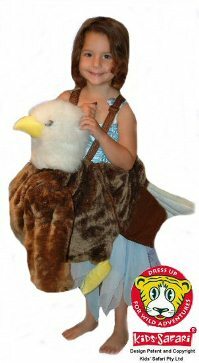 So well made, you can plan on passing it along to younger siblings and cousins for future Halloweens. Imported. 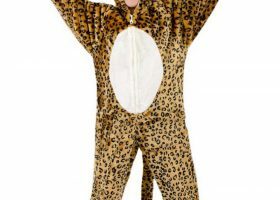 Baby and kids’ Halloween costume is cozy and warm, with back zipper, three-dimensional, stuffed tail, and snap legs for easy diaper changes Soft-sculpture headpiece features great detail, with stuffed horns, ears, eyes, and nose. Secures under the chin with hook ‘n loop closures. Cuffed, pull-on booties feature “dragon toes” and non-slip soles (for indoor wear) Padded wings snap on and off easily, so they’re car-seat friendly 100% Polyester; machine wash cold, gentle cycle, and tumble dry low. Cool iron if necessary. 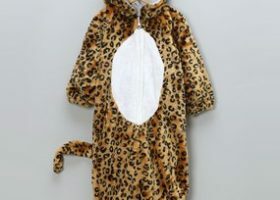 Not intended as sleepwear.